If you’re ready to start investing money, but aren’t sure where to start, consider an easy-to-use app. Even better, if you love watching CNBC’s “Shark Tank” and dream about specifically investing in an early stage startup, then this app is for you. The Newchip app focuses on helping investors find startups and small companies that align with their interests. While other apps don’t necessarily focus specifically on startup companies, Newchip does. Plus, the app makes it easy and affordable to invest in small and pre-IPO (internet public offering) companies, as well as real estate. Since we’re all about trying new apps, especially ones that can help us build our wealth, we decided to download Newchip and test it out for ourselves. Here’s what we discovered so you can decide if it’s the right fit for you. Before you download Newchip, know the basics. It’s free to download and use until you start investing. It’s only available for Apple users right now, or on desktop. You can make your own Newchip account with an email address or by connecting your Facebook account. You can filter and compare investment opportunities by category, industry and sectors. Newchip offers financial education through content on its platform so you can become an even smarter investor. Newchip was ranked as a top 50 startup for 2017. The app aggregates investments from platforms around the U.S. to help investors sort through, build and diversify their portfolio. Very much like the infamous Tinder and Bumble user experiences, Newchip users swipe right on deals they’re interested in, left on ones they’re not and up if they want to skip it for now. All deals you swipe right on are added to your deal tracker. Swiping through investments is pretty fun. Maybe it’s just the act of swiping in general, but after signing up for the Newchip app — which took literally 30 seconds — we found the user experience to be super entertaining. 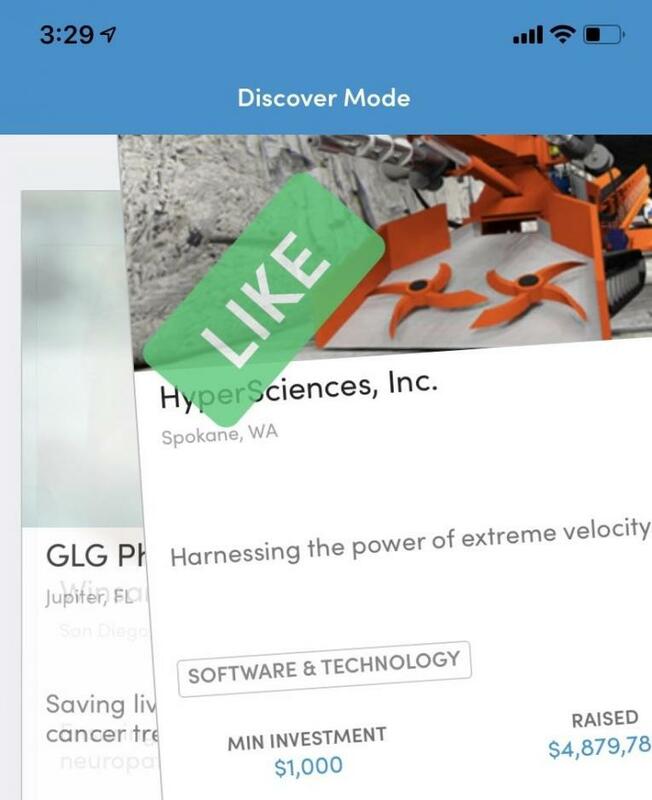 On the Discover tab located on the left of the bottom navigation bar, you can swipe left, right or up on a variety of companies looking for investors. Each company’s card explains what it is, where it’s located, what industry it’s in, how much it’s raised so far, how many days there are left to invest and the minimum investment amount. While swiping, we saw every type of company, from organic food and fitness equipment to brand new social media platforms and electric pickup trucks. Minimum investment amounts seemed to start around $50 and increase to $100, $200, $250, $500, $1,000 or more. We did see one company with a minimum investment of just $1, but the majority are around $100. If you’re not sure where to start, check out what others are doing. You can’t see exactly what others are doing on the Newchip app, but you can see which companies are raking in money from investors. If you’re not sure where to start, consider using the Home tab. It’s in the center of the nav bar and shows which companies are most funded, most popular, fully funded, closing soon and have small or large public raises. Once you choose companies that you like by either swiping right or tapping the “Like” button, they’ll be added to your Deal Tracker which is on the tab second from the left on the nav bar. You can see all the deals you liked, skipped and aren’t interested in. Once you invest in a deal, it’ll be added to your portfolio on this same tab. You can search by sector, too. On the search tab, which is second from the right on the nav bar, you can find investments by sector. Choose from blockchain and tokens, community and lifestyle, energy and clean tech, food and beverage, media and entertainment, real estate and more. You can follow certain sectors and also view deals only in that sector. When you click on “View Deals,” you’ll be taken to the Home tab where you can then see which ones in that sector have been fully funded, are most popular and more. Actually investing takes a few steps. Once you’re ready to invest in one of the companies you found on Newchip, there are few things you’ll have to do. First, you’ll be asked a series of quick questions regarding your investment experience, annual income, net worth and more. Once those are filled in, you’ll then be taken away from Newchip and to the website that manages the deal for the company you want to invest in. Important Note: You don’t actually make the investment through Newchip. Instead, Newchip just aggregates the investments so you can easily find them. Once you’re ready to invest, it’ll lead you to the right place to finish the transaction. You’ll most likely need to sign up for another account through this other website in order to make the investment. 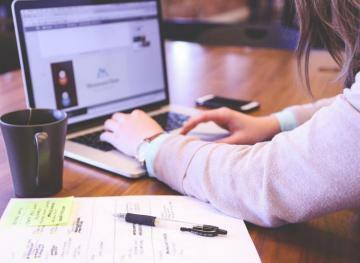 If you’re not comfortable with having so many different accounts for your investments, we suggest thinking through whether this process is right for you. To be completely honest, we enjoy Newchip for the ease of finding cool investment opportunities, but don’t enjoy having to go to another website to actually invest. Financial education, rewards and more round out the app. 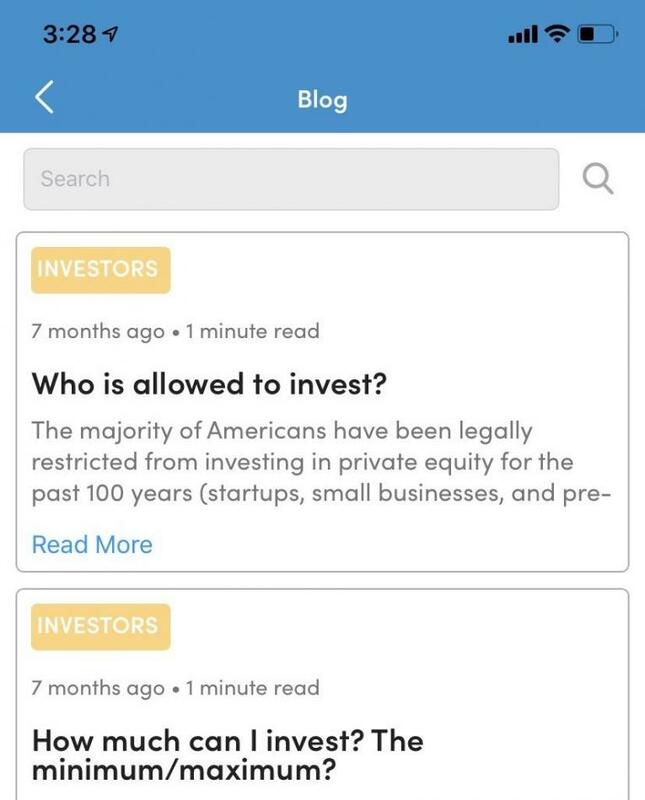 In the Newchip app, you can get helpful info on investing money right in the blog. It’s a nice feature since some apps don’t offer content right inside the app experience. If you’re new to investing, or aren’t sure if you want to invest in a startup that’s in the Newchip app, you can learn more through this helpful content before making a decision. Another cool perk that Newchip offers is rewards for signing up friends. Newchip is free to download, so getting friends to download it should be pretty easy. When you sign up friends, you get the chance to earn swag like T-shirts and bags, as well as a “VIP Award” (though we aren’t sure what that is exactly). 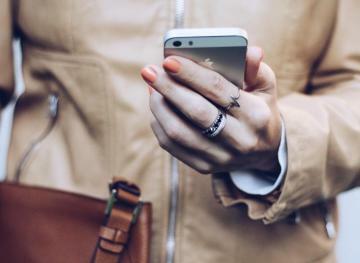 You can connect your contacts in about two seconds and start sending invites right away. If you’re on the entrepreneur side of things and are looking to get investments for your own company, you can also use Newchip. Newchip says it can help you raise $50,000 to $50 million for your business. All you have to do is submit an application. 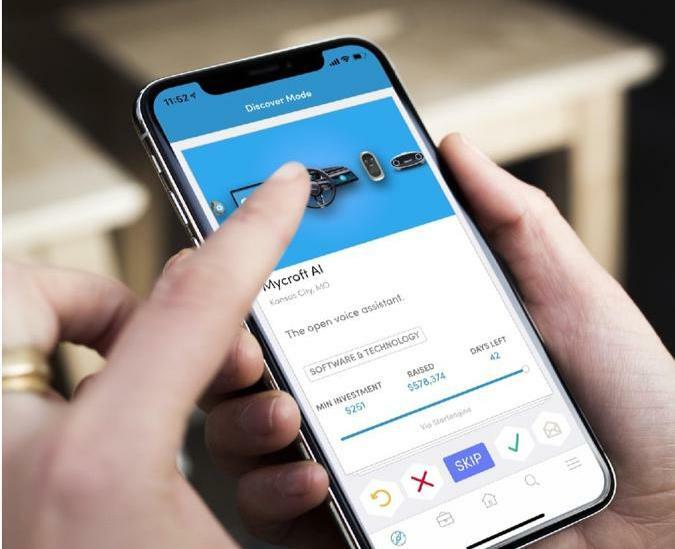 Once evaluated and selected, Newchip will help connect you with the right platform for listing your investment and then will get it on the app. Newchip is still a pretty small company, and it’s sure to grow more over the next few years, especially as more and more startups pop up. So if you’re interested in getting in on the ground floor of a cool new investment experience, we suggest downloading Newchip and checking it out. No one’s guaranteed to make money on their investments, but with Newchip you could end up being one of the first investors in the next big thing. Don’t miss out because you never know what financial opportunities may lay ahead.